Listed below are solutions common issues Clipr users encounter. If you are still having trouble please use the help chat found at the bottom right of the screen. When I click download the video starts playing? This is the most common problem that Clipr users run into, so we have you covered! Due to the way that Twitch functions this problem happens occasionally. There are two solutions to this problem. This is the easiest and recommended solution to the problem. 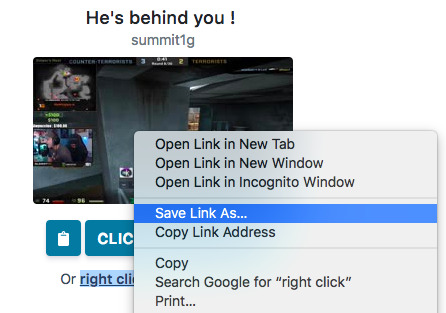 Under every download button there is a link titled "save as" hover over this link, right click, and select the option "Save As" from the list.